Right now, they may be the team to beat in Texas. The Clarendon Bulldogs strutted into Brent Gould Field in Liberal Wednesday with a 30-12 record. But this time the Saints rose up and beat Clarendon 7-1. Seward used eight pitchers to shut down a team who not only was riding a 12 game winning streak, but a team which averages 10 runs per game. Jace Moore pitched two scoreless innings. Tyler Hill was 3-4 while Willie Gustin was 2-2 and Tanner Rainey was 2-5. 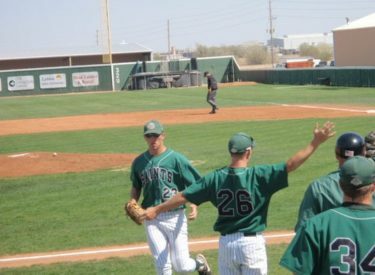 Seward is 29-17 overall while the Bulldogs coached by future BJ manager Mike Silva fall to 30-13. The Jayhawk West leading Saints host Hutchinson Saturday and Sunday at 1 p.m. with the games airing on Talkradio 1270 and kscbnews.net.